Coffee? Tea? Wine? Hotels, inns, and B&B’s that offer complimentary alcoholic beverages are becoming more and more prevalent these days, and the practice is just one way that the lodging industry is winning fans in this age of Culinary Tourism. Inn owners and hotel managers understand that a glass of bubbly can perk up a tired new arrival and turn an ordinary afternoon into a celebration. 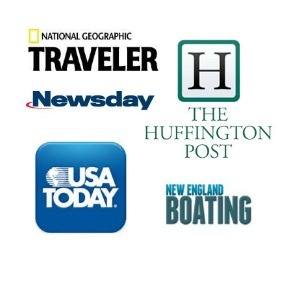 The following lodgings in the Northeast US, offer a glass, or several, of wine, beer, harder stuff, on the house, to each and every guest. 250 Main, Rockland ME. In a mid-coast Maine town known for its artists, art galleries, the Farnsworth Art Museum, and masterful shipbuilders, it was only a matter of time until a boutique hotel showcasing these talents would be built. The nautical-chic lobby and mid-century cool guest rooms of 250 Main are testament to those who live and create in Rockland. In the afternoon, pour yourself a glass of complimentary wine, nibble on some delish appetizers, and check out the beauty and workmanship all around you. It’s like an art gallery opening reception, except you get to spend the night here. Holidae House B&B, Bethel ME: In the afternoon, guests of this sweet, homey inn right on the main street of this Boarding School (Gould Academy) and Ski Resort (Sunday River) town will find a table stocked with variety of liquor, liqueurs, and aperitifs, along with incredible baked goods, in a cozy common-area living room. Far from an “honor bar,” you can pour any amount that pleases you, at no cost. Owners John and Jeannette Poole just want visitors to feel right at home. Made Inn Vermont, Burlington VT: Made Inn Vermont has got to be one of the coolest Victorian-Mod mashups of a B&B ever. But it’s not for everyone. Bathrooms, though private, are not en-suite, and down a long hall. However, each super-stylish guest room features blackboard walls and mid-century modern furnishings…. and a small refrigerator stocked with two very-difficult-to-procure cans of beer – one, a Heady Topper and the other, a Focal Banger – both by local brewer The Alchemist. In addition, you’re invited to enjoy a drink or three each evening with the owner on the backyard patio. What say you now about those down the hall bathrooms? The Taconic, Manchester VT: The Kimpton Hotel brand was one of the first to institute a complimentary wine and nibbles hour from 5-6 every night in a stylish common area: an amenity now being replicated by others in the hospitality biz. Generally, the wine is free-flowing, but here in Vermont, the Law dictates that The Taconic can serve only one glass of wine per person per night. So the hotel makes up for it by offering toothsome appetizers from the in-house chef. Carpe Diem Guesthouse and Spa, Provincetown MA: If you suffer from the trials and tribulations of life, a stay here might just cure some of those ills, particularly if you book an exfoliating scrub-down in Cape Cod’s only Moroccan Hammam, or at least gather with other city escapees for afternoon wine and heavy h’orderves hour. Never underestimate the healing power of communal griping while downing a couple of glasses of white or red. Aspire at Mohegan Sun Resort and Casino, Uncasville CT: Free booze begins to flow at check-in for this “VIP Hotel Within A Hotel,” when you are offered coffee, tea, water or bubbly wine. And this extravagance extends to the private Aspire Dining Room on the 3rd floor, which serves complementary Breakfast, Lunch, and Dinner, and has a full bar. Want a drink? Two? Three? All included with the room. Just remember to tip your server generously. Hotel 48Lex, NY NY: “Complimentary” anything in New York City, especially wine, is such an anomaly, this daily happy hour from 5-6 is incredibly popular. Join your convivial fellow guests in a striking modern living room space with floor to ceiling windows overlooking the commercial buildings of Midtown East Manhattan. It’s quite the pre-dinner party. The Bernic Hotel, NY NY: The main floor reception area in this artsy new boutique hotel might be snug (an understatement) but who cares that the lobby is no larger than a vestibule once you’ve got a stem of Prosecco in hand. It’s a check-in perk that puts you in a good mood immediately – a mood that expands even more once you get a load of your fantastically cute guestroom and its actual, rare-for-NYC outdoor balcony. James Nomad NY NY: The funky-cool lobby of this newly renovated downtown hotel, visible through sidewalk windows, has become a chic meeting place for media and fashion types. Perhaps you’ll catch someone on a job interview or tete-a-tete-ing with a reporter while you sip on Pinots and Chardonnays during the civilly quiet Happy Hour that occurs nightly here. 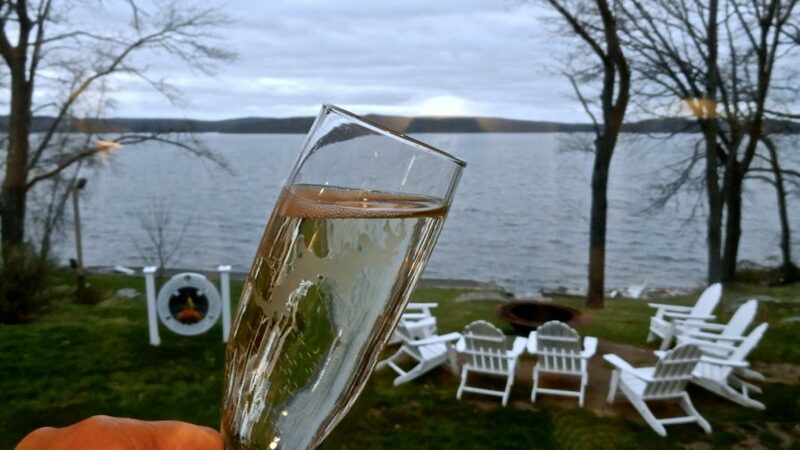 Silver birches Resort, Hawley PA: Late afternoon, your host pours each and every guest a nice glass of Champagne with which to toast the sublime sunset over Lake Wallenpaupack – one of the largest lakes in Pennsylvania – right outside the door. It’s an evening ritual for all guests to enjoy, either inside a pretty sun porch in Winter or outside on the waterfront when it’s warm. Faunbrook B&B, West Chester PA: Kick back and relax at this charming comfy-cozy Victorian B&B. Guest have access to an array of wines round the clock, in a lived-in, easy-peasy parlor furnished with pieces left from the family who lived here early last century. Imbibe any time. No judgment. Blue Water House, Lewes DE: The breakfast and afternoon spread that owner Nick lays out for guests in this casual, vibrantly colored homage to the Caribbean on the Delaware Shore is one of the highlights of a stay here. And one highlight of that highlight is the availability of unlimited bottles of wine and beer. Most guests partake in the common area, but some sneak a bottle of wine or a six-pack to their room now and again. Fortunately, says Nick, that doesn’t happen too often. Mason & Rook. Another Kimpton Hotel, with the same free-flowing wine policy between 5-6pm that other Kimptons share – Mason & Rook features a distinctive chess board in its parlor, just waiting for a couple of players. Red Fox Inn and Tavern, Middleburg VA: Established in 1728 in an area of Virginia renowned for fox hunting, the Red Fox drew celebrities like Elizabeth Taylor and Jackie Kennedy who would stay here every year during hunting season. How has the Red Fox stayed in business for nearly 300 years? Most likely by treating guests like beloved family – and handing out a glass of bubbly on arrival (or a coupon for a specialty cocktail in the Tavern later). The Martha, Abingdon VA: Sometimes, you find tranquility in a generously poured glass of port sipped in a baronial living room right before bedtime. This ritual is even more relaxing after a few laps in the indoor heated saltwater pool or following a rollicking stage production across the street at the famous 1933 Barter Theatre.